While I was in the middle of writing this post, the SIOA Facebook GROUP was reinstated (for now) on Facebook. 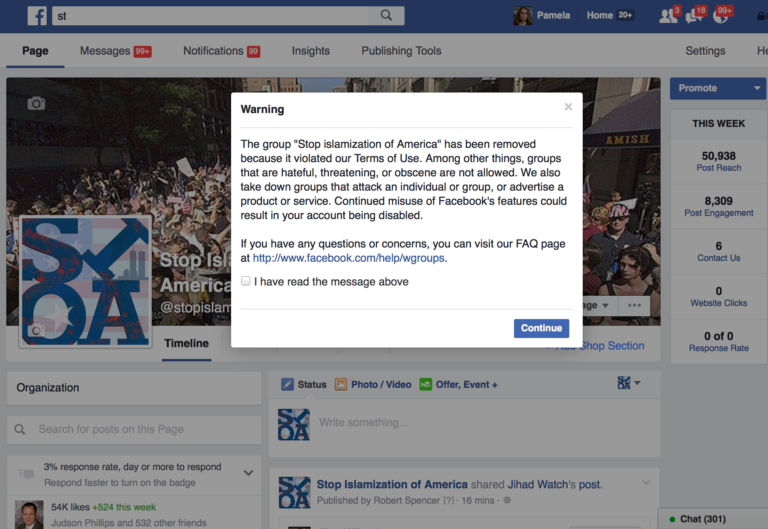 Pamela Geller reported earlier that her Stop Islamization of America (SIOA) Facebook GROUP has been removed from Facebook today in the wake of the Islamic terrorist attack on a gay nightclub in Orlando, FL. In the headline of her blog post she misidentified it as being her SIOA PAGE that had been removed. Her SIOA PAGE is still on Facebook. But, her SIOA GROUP is was gone. It has since been reinstated. Facebook has removed my group, Stop Islamization of America, in the wake of the jihad slaughter at a gay nightclub in Florida. We had over 50,000 members please politely request reinstatement of our group. The group has been live since 2010. This is an outrage. Sharia enforcement in the wake of jihad slaughter? Facebook pages are virtually worthless compared to groups. Interaction on pages is probably about 75-95% less than it is in a group. You'll get Earlier I got a "Content not found" message (as seen below) when clicking on this link because the GROUP has had been removed as you can see below. But, if you click on the link to the GROUP above, you'll see that it has been reinstated on Facebook. I'm glad the SIOA group is again available online...but, in all honesty, I find it amazing that it's been allowed to remain on Facebook for as long as it has. You see, Facebook is a private entity and it is their platform that we all use. They don't HAVE TO ALLOW ANYTHING THEY DON'T WANT to appear on THEIR PLATFORM. (Same goes for YouTube, Twitter, Blogger, etc.) That doesn't mean they're infringing on your freedom of speech if they don't want your hateful words on their platform. You're there at THEIR mercy...whether you like it or not. You do not have a Constitutionally-guaranteed right to FACEBOOK. You do have a Constitutionally-guaranteed right to freedom of speech. When/if Facebook removes your content, that action does not infringe on your rights. You still have the right to say whatever you want wherever else you want...as long as it's on a platform that chooses to allow it. And, if you can't find a place online that will tolerate your harsh speech you can always create a sandwich board and walk around with it in your town. See? Your free speech rights still exist whether Facebook allows you to say whatever you want on their platform or not. Or, you could simply be smarter by toning down the language you use and still convey the same thought? But why do that, right? It's much easier to blame Facebook rather than yourself, right? Now, Pamela Geller does NOT talk or create Facebook posts in a manner that is consistent with what rational people label as "hate speech." Too many of the people who comment on her posts in her group and on her facebook page, however, DO. Those of you who want to behave as 7th grade boys and call muslims names like "mooslimes" and/or "muzzies" (and worse) and say things like "death to all muslims" or "f_ck all goat humpers" (and worse), it is YOU who are putting Pamela's existence on Facebook at risk!!! Grow up, for Pamela's sake and carry on an adult conversation or don't complain when her Facebook group is banned permanently by Facebook. For it will be YOU that will have caused it!!! Personally, I think Pamela should BAN those of you who DO put her group at risk...because, like I said, it is those of you who comment like you're a 13-year old boy with your junior high insults and cuss words directed toward all muslims that put her group and page at risk. It's not the things that SHE says or posts that does. I know what I just said will piss off those same people who comment as junior high schoolers on Pamela's page and in her group. Unlike Pamela, I WILL ban you from this blog if you can't behave as an adult here. I have zero tolerance for the waste-of-time comments from simpletons who are only big-talking keyboard warriors that think that if they talk like a big prick online that they're accomplishing something. It's too bad I've blocked so many of these people on Facebook...those who talk like I described in Pamela's group and on her page...none of them will see this post of mine...so, please, feel free to post it yourself so that more of these morons CAN see it...for it is THEM that need to hear this message. Complying with Facebook's (or those of any other social site) terms isn't called "being PC," it's called "being SMART"..if you want to utilize their platform, that is. Pamela Geller has posted another blog post in which she states that she has personally been banned from posting on Facebook for 30 days. She also provides the text and screen shot of the "offending post" that resulted in her being banned. As I said earlier in this blog post, "Pamela Geller does NOT talk or create Facebook posts in a manner that is consistent with what rational people label as "hate speech."" No one ever accused Facebook of being "rational," least of all me. There is nothing new nor inconsistent in the language Pamela used in her post today that should have resulted in her being banned. And, one of the warnings that Pamela has posted on her blog says "You've repeatedly posted things that are not allowed on Facebook." Why, then, is it just today...the day of the Islamic terror attack in Orlando...that she is being banned, Facebook?